According to the software that I wrote to manage Cooking For Engineers, I started writing this review of Kitchen Mysteries in January of 2008. I've been kind of stuck since I read it then and have spent the last year deciding what I should do about books, equipment, and restaurants that I can't wholeheartedly recommend. As a way to reduce my work load, I decided when I joined Fanpop in 2006 that I wouldn't publish reviews of products and places that I didn't like. This decision was partly so the only content on Cooking For Engineers would be primarily of high quality or recommended stuff, but, mostly, it was so I wouldn't have to actually write those articles. I think I decided this morning that going forward I'll make some exceptions to this rule. So here's the first. 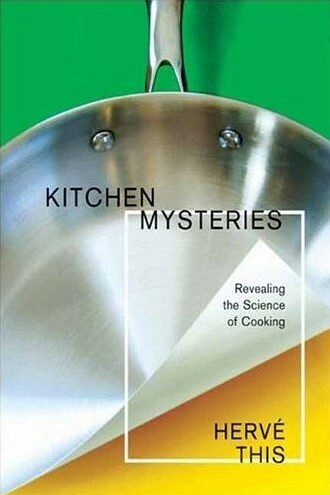 When an English language translation of Hervé This's Kitchen Mysteries was published in late 2007, I was pretty excited to read what he had to say. This (I think it's pronounced "tees") is famous as one of the founders of molecular gastronomy and for publishing a book by the same name in 2002. In his new book, he dives into some of the science of the kitchen and how it affects the way we cook. I was hoping for a book similar to those written by Harold McGee and Robert Wolke, but, unfortunately, that wasn't what I got. Kitchen Mysteries is a weird book to read, and I didn't find it easy to get through. Many of the sentences felt oddly constructed and the logical flow of some sections and paragraphs seem weird and disjointed. A lot of the time, This skips entire descriptions and logical steps when discussing a particular kitchen phenomenon (exactly the behavior he laments at the beginning of the book). I don't know if it's how This writes, if the French prefer to have their books written in this style, or if Jody Gladding translated the text poorly, but half the time I don't know what I'm reading about or where he's going until much further in the section and after having made several logical leaps to figure out what he's talking about. This (or Gladding) dives in and out of plain language (the parts that make sense) and esoteric prose that borders on poetry (the parts that require imagination to understand the author). Finally, the last gripe I want to mention is that This constantly introduces topics, talks about them for two or three paragraphs and then moves onto something else without answering the question or even making a real attempt! For example, in the section entitled "How Long Must Vegetables Be Cooked? ", he begins by saying there is no global answer (which is a good start). Then he has a paragraph (3 sentences) on how the cell walls become porous (due to pectins and hemicellulose being altered chemically by the heat) allowing water to pass in and out of the cells. Then he moves on without segue to a final paragraph (2 sentences) mentioning how vegetables can swell if a little salt is present or harden when too much salt is present in the water. End of section. Nine sentences. Question unanswered and, in actual fact, only addressed in the first couple lines. The section should have been called "A Couple Things I Noticed About Heating Vegetables". This does this all the time through the book, and I found it infuriatingly frustrating. And, now, I think I've spent more than enough of my life reading and discussing this book. I just thought of another thing that annoyed me. This mentioned in a footnote that often gourmands are ranked higher than gourmets and this is incorrect. Gourmets are people who delight in wine and gourmands are people who delight in good food. I don't know if this was a translation problem, but these are news to me. I'm not familiar with the supposed hierarchy that This feels necessary to dispute (maybe it's a French language thing?) and I've certainly never heard or read anything that even hints that gourmand = food and gourmet = wine. If there's a translation issue here, then these should have been a note from the translator (which I feel should be liberally provided throughout the entire book). If you do choose to read the book, I would suggest that unless you have secondary material backing up any of This's comments or claims, be careful when quoting his statements as fact. There's no question that his work has inspired a lot of other people to do great things. And his work with eggs and foams has been very important. But he's not that compelling in person either. He doesn't enjoy food, and it shows. The talk I saw him give in NYC was disjointed, just as you describe the book. In contrast, I recently saw Harold McGee talk about molecular cooking, and he was much more entertaining! According to Larousse "A gourmand merely enjoys good food, whereas a gourmet knows how to chose and appreciate it". As far as language is considered Joesan's definition and hierarchy are correct. As a rule of thumb one could say that Gourmand refers to an attitude toward "everyday food" while Gourmet is closely related to "fine food and meals" (As a matter of fact in french "Gourmet" is often used as a noun with "fine" as an adjective i-e: fin gourmet). Gourmand carries a "pleasure" idea while Gourmet carries "knowledge" and thus another level of "pleasure". On the other hand (and even though the words do not specify what kind of food we are talking about), French will most of the time imply that a Gourmand is more into sweet food... someone who loves chocolate, cakes, ice creams, pastries and such will be said to be a Gourmand. PS : the knowledge issue might be the reason of the wine issue but I have to say it's the first time I hear the gourmet/wine association. All of the definitions seem relatively consistent - so I'm not crazy thinking the "wine" footnote was weird. I had the same dilemma with my site until I realized that avoiding something bad is something good. I now review things I think others should try and things I think others should avoid. Anything in between that's so-so I avoid. I bought this book in its English version, although I am a French/English bilingual. From the very beginning, I was extremely irritated at the bad translation, Gladding very often simply translates words, but not meaning. This explains the confusion that anyone not fluent in French experiences when reading the text. The only way to understand many passages is to retranslate them back into French and then they begin to make sense. Gladding also uses the strangest words for terms which any person familiar with cookery books should know: e.g. Glucides for sugars or odour for smell or fragrance. She talks about grape leaves when it should clearly say vine leaves, grapes do not have leaves if I remember correctly. Very often she uses the word "fluids" when the term "liquids" is appropriate. And so on, and so on. A very annoying book indeed, both because of the author's shortcomings and even more as a result of the atrocious translation which any professional translator should be ashamed of. That explains a lot! I wonder if the translation was handled that way on purpose to make the book seem more exotic / sound more authoritative (due to the use of uncommon words or phrases)?